Worf, Dax, and Kor go on a quest to recover the long-lost Sword of Kahless, which legend has it will unite the Klingon people. The reference to "Kirk on Organia" is recalling TOS' "Errand of Mercy." 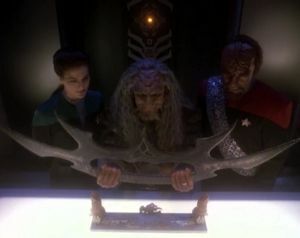 The Sword of Kahless is like the Klingon equivalent to the Holy Grail. Indeed, this episode has a lot of similarities to Indiana Jones and the Last Crusade. It's cool that we see another Lethean like the one that attacked Bashir in "Distant Voices." I want to know more about the Hur'q Invasion of Qo'noS. That sounds epic. An oddity: when picking a shuttle, Worf says "The Rio Grande is available," but in the subtitles, he says "The Mekong is available." This happens every time the shuttle is mentioned by name. Kor's pretty awesome. He seems to be the one Klingon who really enjoys being a Klingon. I find it exceptionally silly that Dax and Worf can disable a centuries-old force field in a manner of seconds that an entire Vulcan survey team couldn't break through, just because they "reversed the polarity" and "increased the amplitude" of their phase disruptor devices. Toral has inhereted his family's stupidity. Their big plan was to just take it from Worf and the Dahar Master, with no back-up? It's amazing that the sword is still strong and sharp enough to kill after sitting around in a cave for a millenium. The show writers were perplexed that fans were upset with the lack of any sci-fi or supernatural explanation for Worf and Kor turning on each other after laying hands on the sword. However, there are two reasons I am going to side with the fans on this one: (1) it's impossible for a Trek audience not to have this expectation, as we have seen people and objects have similar effects on our characters in the past, not to mention the fact that this is a thinly-veiled Indiana Jones-style tale, and every object Jones goes after in his adventures has some kind of supernatural aspect; and (2) more importantly, Worf's character is taken so far that he is willing to straight-up murder Kor in order to get the sword and take leadership over the entire Klingon Empire, and the lack of any kind of outside explanation for this, that's way too far--even further, for example, than his unwillingness to save the Romulan in "The Enemy." Worf has been cold, he has been ambitious, and he has been swept up in religious ferver, but he has never lost his way as far as he does here, and fans are right to expect there to be a logical explanation for that. I love Dax stunning both of them with a "Be quiet!" This is a case of the writers being so in love with an idea that they shoe-horned the characters into the plot rather than let the plot spring organically from the characters. It's a neat fable--the sword meant to unite the Klingon Empire with its power actually divides people with avarice--but making Worf so drunk with a lust for power just doesn't work. It paints him in a bad light that is inconsistent, and it's a big misstep for an episode that is supposed to be DS9's first fully Worf-centric story.